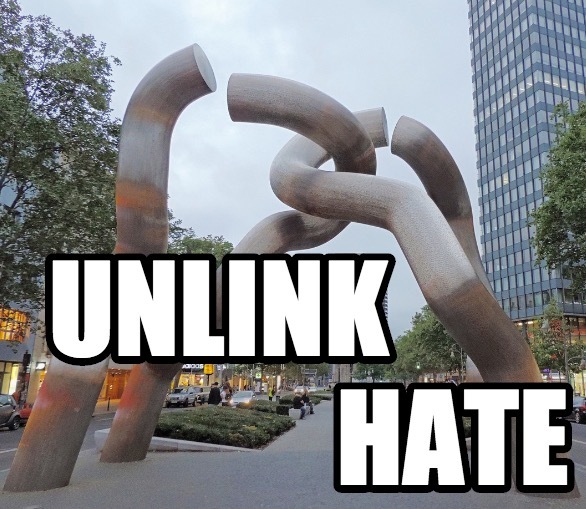 Librarians: please unlink or nofollow sites you don’t want to lend your authority to. Librarians have a few staple websites we go to when we teach information literacy, especially lately when people talk about fake news. There’s the tree octopus. And there’s MartinLutherKing.org, a site that looks like it might be informative at a glance but is actually run by white supremacists. We put these links in our teaching materials and show people how to evaluate information they find online. However, there’s a problem with this approach. When libraries link to other websites, even if it’s just to say “This is garbage.” search engines see this inbound link and say, in a way only a dumb robot could “Oh hey, this authoritative site is linking to this other site. That must make that other site fractionally more authoritative than we thought it was.” The robot can’t, or doesn’t, read the context of the link, the part that says “This is garbage.” What this means it that our inbound links to this racist website are actually causing it to rank more highly in Google search results; it’s usually on the first page of results when you search for Dr. King. Watch this short useful video for more specifics on what is actually happening. Removing the link. You can leave the words, just remove the link. Adding a “nofollow” tag to the link. Here’s what that means and how to do it. If you see other libraries or websites linking to this site, encourage them to do the same. We helped cause this, we should help fix this. Thank you. I do not see what harm it causes if racist websites exist, and, by extension, if links to them cause them to be more easily found in a search engine index. We have to give educators credit for teaching students how to evaluate information. We should allow them to separate the good from the bad for themselves, and recognize that it is not the librarian’s role to be a gatekeeper. (I do not even think it is fitting for them to attach labels like “this is garbage”; imagine if that were written below a shelf of books in the stacks). As Milton said in the _Areopagitica_: “I cannot praise a fugitive and cloister’d vertue, unexercis’d & unbreath’d, that never sallies out and sees her adversary.” If someone has information literacy and knows the best theories in a particular field, then it does them no harm to encounter falsehood. Insofar as racist arguments are silly or not grounded in fact, they are in no way threatening to thinking people, nor are they able to convince anyone into becoming racists themselves. By like token, we teach students about how people used to believe in Galenic medicine (humor theory) without fear that they will abandon their belief in modern medicine as a result. I also recall the following dictum from library school: “There is no book so bad that it does not contain something good.” (Apparently the quotation comes from Pliny the Elder, though I remember it being attributed to John Stuart Mill; Mill does indeed express similar sentiments against censorship in _On Liberty_). Of course, in this case “book” can be extended to the Internet and the information contained on it. In the case of such racist websites, we could say that these resources are useful (they contain a certain “good”) in that they constitute primary sources into the thinking of a certain stratum in society, and that could be important to sociologists and other researchers who study these groups. Kenny — no one is saying do not talk about racist websites, they’re not even saying “Don’t show people racist websites” they ARE saying that when you, as a library, provide links to racist websites you are, possibly unwittingly, adding “authority’ to them in the eyes of Google and if the message you are trying to get across is “This is not authoritative” then you may be working at cross purposes to your intended goal. It’s actually super important to know about these websites. It’s also super important to know how the linking and reputation mechanisms of the internet work so that you can use all the tools available to get the information out that you are trying to pass along. This is part of that process. I agree with Kenny. While I think it’s wonderful you’re so compassionate and don’t want to encourage these sites to receive a higher search result ranking on Google (as I’m sure no librarian likes the thought of) this is classic censorship under the guise of good intentions Firstly, picture if we listed the books that we didn’t agree with farther down on the catalog results page? This is essentially what you’re advocating for. Secondly, we need to give users more credit when evaluating information. All we can do is give out the skills to evaluate. It’s up to them afterwards to decide for themselves what they think. Thirdly, I always try to remember that Google is a complex search engine. Simply because something is visited more often does not mean it will automatically appear higher on the search results page. Google employs many avenues that dictate where results fall in the line up. See this for more information: https://computer.howstuffworks.com/internet/basics/google1.htm And they don’t even mention in that article about paid keywords which is a business onto itself. Meaning I can pay Google to have my website higher in the results list. This is a huge industry and often dictates quite a lot of what is on the first page of results. Thereâ€™s a difference between asking libraries to remove Mein Kampf from its bookshelves and asking libraries to not showcase Mein Kampf front and center when patrons walk in the door. Conflating a request for non-endorsement with censorship lacks nuance at best and is disingenuous at worst. I guess I’m not understanding how clicking on links to demonstrate to students how to evaluate information is endorsement and/or the same as showcasing Mein Kampf front and center at the library? Abby — I think it’s because we now know (and may not have know to the same degree before) that having a link from a library (an authoritative site) TO another site, gives a boost of Google ranking to the thing we link to. Once we know that, it’s part of the whole ecosystem of “thinking about linking” to ask if we really want to do that. I think people should learn about MartinLutherKing.org and understand why it’s there and why people made it and how that relates to the political climate in the US. But that doesn’t mean I want to support them which is what I would be doing if I included a live link in my LibGuide or website. Google sees that as a +1 sort of situation and gives it more page rank. The main reason that site ranks so highly is because of all those inboiund links from libraries and other places saying “Watch out for this” We can talk about it without linking to it. But this was a great conversation, thanks for starting this dialogue. I think the problem lies with the Google’s PageRank algorithm. It’s way too simple to say that linking to a page constitutes an endorsement or even a moral evaluation of the creators of the linked resource. PageRank is based on a binary principle, and I guess that can easily be adapted to a Manichaen outlook, in which we link only to the good forces and make sure that the evil ones are left out. In reality, the world of information is much more nuanced, and people cite information sources for all sorts of reasons. For example, I am reading through the second volume of Stephen Kotkin’s biography of Stalin right now, and some of his footnotes are to historians that he disagrees with (such as E.H. Carr and J. Arch Getty). Kotkin also sites historical primary sources, such as the _Short Course_, which Stalin edited and in part wrote, a kind of communist analog to _Mein Kampf_. Similar things go on with hyperlinks (the hypertext equivalent of a footnote in some sense) on the Internet. I appreciate the power that Google wields in the modern world, and I am sure that they are interested in getting librarians and academics to accept the principles behind PageRank (hence their public liaison on Twitter who is linked to in this blog post). But Google is a poor finding aid compared to many library catalogs and indexes with rich human-edited metadata, even though Google has by far the larger information set. After all, there really shouldn’t be a grand hierarchy of information in which some resources are deprecated to the point of being practically unfindable (or stricken from the index). If a researcher needs a catalog of hate speech or other marginal kinds of expression, then that should be able to be summoned up. Perhaps students and members of the public should be reminded that just because a site appears on the first page of Google results doesn’t mean that it should be trusted or considered to have “authority.” That kind of skepticism comes with information literacy. Would it be possible to link to these kind of sites through the Internet Archive’s Wayback Machine? My thought process here would be that this would prevent Search engines from crawl links directly to these sites (including if they decide not to respect nofollow for some odd reason), would avoid them potential marketing of any increases in page traffic, and would ensure links would not be broken when these kinds of sites go down (a la the Daily Stormer earlier this year). It doesn’t appear as if the Wayback machine makes any calls to sites once they’re archived, and I don’t think Google takes into account any data from this in determining search results. I’m curious what everyone thinks of this approach. It’s not that providing a link constitutes some sort of moral endorsement of the content, but based on how Google’s PageRank algorithm operates it would be unrealistic to pretend it’s not, on some level, a functional endorsement of the site. I like Brian’s idea. It still allows people to access the content, and denies the producers of the content the boost in their PageRank. Another option is to list the URL without actually linking it, as Jessamyn does with the MLK site in this post. Isn’t the tree octopus a harmless parody site? Mentioning it in the same sentence as the MLK site without more context seems to put them in a really bad light. I’ve now had a lot of good results starting with the links on this page. I’ve contacted, personally, every site owner that was linking to martinlutherking dot org who seemed to be doing so accidentally and explained the situation and asked them to add a “rel=nofollow”. They all did. Seven out of seven. I’ll work on page two. Yeah, I still, even after reading through all the comments again – still strongly feel this is censorship – albeit in a very roundabout way – for the reasons discussed above. I don’t think you can justify a label of “censorship” to all of the proposed solutions to this particular issue. Proposing solutions that provide access to the content without providing material support to the creators of said content is not censorship. Jessamyn, your link to openprofiler.org doesn’t work for me. I was able to log in and create an account, but even then the link doesn’t work. I had to create a profile for the mlk site manually. Paul, I definitely get what you are saying. And I can definitely see a library or school making the choice not to use some of these sites in their resources – as to not give them more clicks – a matter of personal choice/preference. That I have no issue with. However, us going out of our way to locate establishments that are using the links as teaching tools and asking them to remove them – that’s the part that seems like censorship to me. And like a MAJOR gray area. What if someone else made this plea about a site they didn’t like – let’s say they were uncomfortable with a pro-choice site or a site about transgender issues being used in a class teaching guide for example. And they spent all day asking establishments to remove the link so it wouldn’t get a better search result spot on Google. I think you’d call that censorship. Are we now, as librarians, experts on morality and society and things? I don’t feel as librarians, that’s really our role. It’s to disseminate information right? I know this is an age-old debate. But I’d really like to hear a counterpoint to that because I can’t see around that. Abby, I did not ask anyone to remove any links. I just showed them how to add rel=”nofollow” to the link in order to not add Page Rank to that site. Everyone I contacted had no idea they were linking to a racist hate site. Some of them made their own decision to remove the link. Paul: thanks for that, no idea why that link didn’t work for you. It is clear from the context of his site that he respects Martin Luther King, Jr. and would not knowingly be linking to the mlk site he is linking to in the context that he is using. In this case, I see no problem with sending the maintainer of the website a heads-up email, to let him know more about the content he is linking to and maybe even to suggest an alternative link. In other cases, where people are knowingly linking to the content to provide an example for evaluating sources in an information literacy context, I don’t see a problem with providing them with ways to still provide access to the content without inflating the page ranking of a hate group. There are ways proposed in this thread where the user experience does not change one iota, but the group can still be denied their page ranking in Google. They were tactically duplicitous when they camped on the name of Martin Luther King Jr. for their website. There is no reason not to be tatical about not providing them with any material benefit when using them as an example for purposes of education and information literacy. I don’t see any lens through which this can be viewed as censorship. And Jessamyn, it looks like the link was somehow blocked by my work firewall. It works fine from home. Brian: I’m not sure that the Internet Archive doesn’t make calls to the originating sites for images, though for the purposes of Page Rank it’s probably fine. Abby: I’m sort of hardline about this and I think censorship is something that basically governments and people in positions of power can do (a library could be in such a position of power, for example). So I think just being a person and emailing someone “Hey I don’t like that you link to that racist site, unlink it please because I think racism is bad” is still just exercising your own free speech rights versus other people’s. So, for example, there were people in this list of backlinks who clearly were linking to mlk.org because they basically agreed with the general approach of the website. I didn’t bother to contact them, that was their choice and they made it. Everyone else, I just let them know what the issue was and left them to make their own decisions because I suspected they had made a mistake. I see it sort of like people emailing advertisers “Hey did you know that your ads show up on Breitbart? That makes me think worse about your brand” and then people can do what they want with that information. Many people don’t know that their ads show up on racist sites, that’s helpful information for them to know. Maybe they don’t care, maybe they do care. Ultimately the choice is theirs. Yikes! This goes against the library bill of rights and all library ethics! @Abby: I don’t think being in a position of power violates library ethics – abusing that position (and community trust) does. We exercise judgement with every item we purchase (or choose not to purchase), although that could be viewed as censorship by a patron who disagrees with it. We also have a mechanism for patrons to challenge items in the collection, and we either keep or weed the item based on a reconsideration. Again, an everyday professional responsibility, and not inherently censorship, but something that could be censorship if abused. Linking to wolf-in-sheep’s-clothing websites is the same story: it might be an accident because the site owner didn’t realize the website was so disingenuous. Thanks to Jessamyn, now they do, and they can make a more informed decision. That’s good, and not censorship – Jessamyn hacking into their websites to make the change herself would be censorship. A patron telling me why they disagree with a book (based on content or a criteria I may have missed) is just sharing information – a patron stealing the book so no one else can read it is censorship. FWIW, I’m a search engine optimizer, and my main clients are libraries. If you have questions about PageRank or how Google works, I’m happy to answer. I’m thrilled that Jessamyn’s campaign has created a surge in interest about SEO in libraries. Because Google considers library websites highly authoritative, your links are worth a lot. Brian: To answer your question, linking to the Internet Archive version of the page would pass PageRank to IA, not the MLK site. So it’s an elegant solution if you’re unable to add a no-follow attribute to your links (for instance, that might be difficult in a CMS, e.g. Drupal).